What’s VPNArea? VPNArea is an Offshore Security LTD, a VAT registered company in eastern Europe in the Republic of Bulgaria. VPNArea servers are physically located in numerous countries around the globe. VPNArea web site and email servers are hosted in Switzerland. VPNArea spreads many servers in over 70 countries with powerful chameleon technology. You have unlimited access to their fast VPN network. They never oversold and high speed optimized. VPNArea has a strict Non-logging policy. They don’t record any logs on their VPN or DNS servers. You can get anonymity by using the same address as fellow members. It applies the strongest encryption AES-256-bit to protect your online browsing history and internet traffic. What is more, this is an interesting review to someone traveling to China. If you have problems accessing social sites and not knowing what exactly you can going to do, but done some research, read some reviews and can tell you VPNarea is the provider that works in China. Had no problems accessing Twitter, Youtube and Facebook. Learn more below. VPNArea offers unlimited bandwidth. So, you don’t worry about your data consumption, there are no limits. VPNArea allows 6 simultaneous connections on different devices. You can enjoy the service on up to 6 devices at the same time or share your account with a friend. VPNArea provides different technologies like Kill Switch, double VPN, Stealth VPN, stunnel or chameleon. The chameleon protocol ensures that deep packet detection (DPI) does not recognize the packet by disrupting the OpenVPN meta-packet, while maintaining a stable and fast speed. The technology uses the unmodified openvpn256-bit protocol to encrypt basic data. The result is that users can break through government, corporate, and ISP restrictions without compromising the security of known openvpns. In other words, the chameleon protocol guarantees security, stability, speed, and breaking through limits. It also allows P2P torrenting. You are allowed to download P2P content even on VPNArea servers in almost all countries, even in USA/Canada. It’s perfect to use VPNArea to unblock streaming sites and watch your favorite content from abroad with VPNArea special streaming servers. You can pay directly with PayPal or Visa, Mastercard, Maestro, Discover, American Express (AmEx), UnionPay, JCB. You can also pay with Bitcoin, Webmoney and Payza. 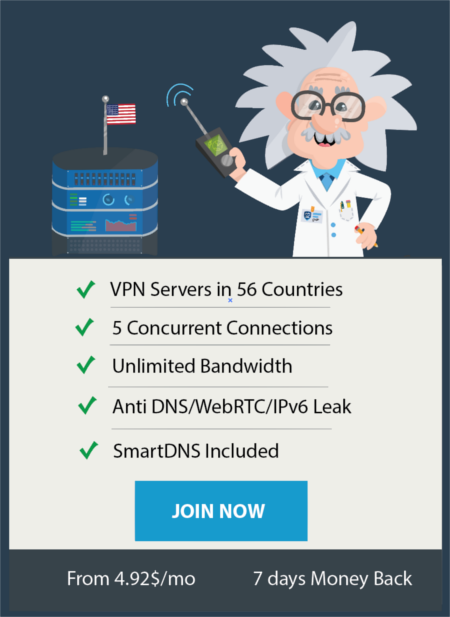 Change IP to 70 countries: Unlimited access to VPNArea’s Big and Fast VPN network. Never oversold. High speed optimized. Connect 6 devices: allows 6 devices like PCs, Phones to simultaneously connect to the services or share your account with your friends, family or colleagues. Unlimited bandwidth: Don’t worry about your data consumption, there are no limits. Speed Test: Test Ping and Download speed to find out the fastest server for you. Double VPN servers: We have Double VPN servers where your connection will go not through one but through 2 VPN servers of ours. Stealth VPN/Stunnel: Are you in China or UAE? Our obfuscation option will mask your internet traffic to look like regular https:// (SSL) traffic with the help of Stunnel. Kill Switch System: Kill Switch (if enabled) will protect your IP in case of VPN disconnection. ‘Server Load’ Monitor: With our software you can see how busy a server is before you connect to it. Ad Blocking: Block Ads and stop your ISP from seeing what addresses you visit with our DNS servers. No IPv6 & WebRTC & DNS leaks: WebRTC & IPv6 & DNS could leak your real IP address despite having a VPN. Not with our software. Devices Supported: VPNArea provides software and apps working well with all version of Windows, MACOS, Android, iOS, Linux and routers. You can get setup instructions from VPNArea support team. What does 7-day Money Back Guarantee Mean? This Refund Policy is subject to our full Terms and Conditions. Refunds could take up to 72 hours to process. If you paid via Bitcoin, you’ll also have to send us the Bitcoin wallet address to which you’d like us to refund you. 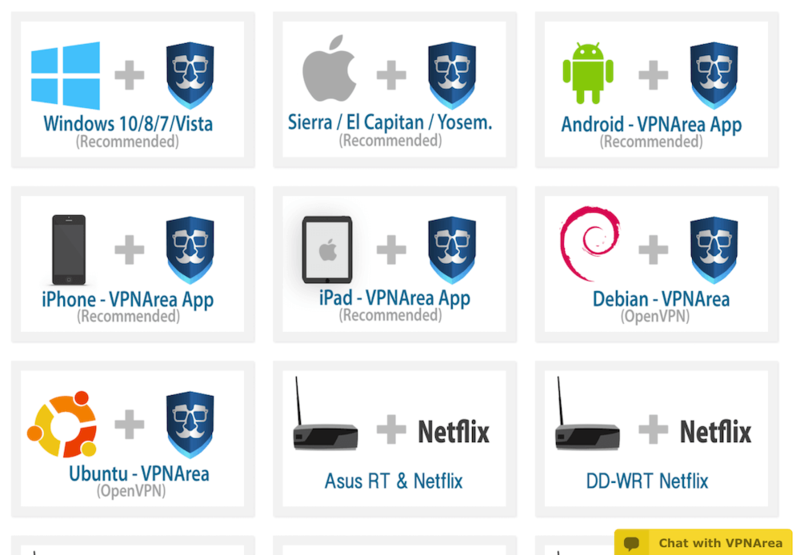 What Devices and Operating Systems VPNArea is Compatible with? VPNArea will work on versions of Windows from 7 to the latest Windows 10 or newer, Mac (Yosemite up to the newest), iOS (iPad, iPhone) and Android, All Linux and numerous routers. VPNArea also supports naive IKEv2 VPN protocol which many operating systems and devices like blackberry or Windows phone support too. VPNArea has their own developed Apps with many extra features and enhanced security, their developers have spent thousands of hours perfecting that software with simplicity and efficiency in mind. Where are VPNArea Servers Located in? VPNArea scatters servers in 70 countries and counting… and you have unlimited access to high speed servers in 70 countries worldwide: Australia, Argentina, Austria, Albania, Belgium, Belarus, Bulgaria, Brazil, Canada, Chile, China, Colombia, Czech Republic, Costa Rica, Cyprus, Denmark, Egypt, Estonia, Finland, France, Greece, Germany, HongKong, Hungary, Honduras, India, Indonesia, Iceland, Iran, Ireland, Isle of Man, Israel, Italy, Japan, Kyrgyzstan, Kuwait, Luxembourg, Latvia, Lithuania, Liechtenstein, Mexico, Malaysia, Moldova, New Zealand, Netherlands, Norway, Poland, Portugal, Panama, Philippines, Romania, Russia, Serbia, Spain, South Africa, Singapore, Switzerland, Sweden, Slovakia, Slovenia, South Korea, Turkey, Tunisia, Taiwan, United States, UAE, United Kingdom, Ukraine, Vietnam. Does VPNArea Keep Logs of My Online Activities? You do not have to give us any personally identifiable (“personal”) information to browse our Site, but to subscribe to our Services you must create an account and register with us. We do not track you or your internet activities while logged into the VPN Service. In general, we collect the following information from users: Account Information. To create an account, you will need to provide certain personal information, such as an email address. You will also need to select a username and password and provide us with payment information. If you choose to pay with a credit card, or PayPal the only personal information collected will be collected by PayPal and Paymentwall. After you have created an account, you will be able to renew your subscription through Members Area. What Encryption Level does VPNArea Use? VPNArea uses AES-256 cipher encryption with SHA256 to ensure integrity and 4096 bits RSA keys for handshake on our OpenVPN servers. For IKEv2 they also use AES-256 with SHA512. It is considered that this encryption combination is lifetimes ahead of any foreseeable decryption technology. 256-bit encryption is referring to the length of the encryption key used to encrypt a data stream or file. A hacker or cracker will require 2256 different combinations to break a 256-bit encrypted message, which is virtually impossible to be broken by even the fastest computers. AES-256 is a symmetrical encryption algorithm adopted by the U.S. and Canadian governments as standards for encrypting transited data and data at rest. Because of the 256-Bits length of the key and the number of hashes, it takes a long time for a hacker to perform a dictionary attack. Let’s say hypothetically all the super computers in the world (the ultimate brute force attack) decided to group up and tasked themselves to decrypt your AES-256 key so they could access your data. Assume they could look at 250 keys per second (which is approximately one quadrillion keys/second – a very generous assumption). A year is approximately 31,557,600 seconds. This means that by using the one billion super computers required to do this, they could check about 275 keys per year. A hacker or cracker will require 2256 different combinations to break a 256-bit encrypted message, which is virtually impossible to be broken by even the fastest computers. What VPN Protocols does VPNArea Support? VPNArea supports the super-secure OpenVPN protocol and also IKEv2 VPN which allows for 50%-100% faster speeds than you’ll ever see with other VPN providers. OpenVPN is one of the most popular VPN protocols due to its open-source nature. It’s used by many people and organizations for different purposes on many different systems and devices. OpenVPN is an open source VPN protocol. OpenVPN uses a custom security protocol that relies heavily on OpenSSL, similar to the encryption used on HTTPS websites. Because it can be configured to use any port, it can easily be disguised as normal internet traffic and is therefore very difficult to block. It supports several encryption algorithms, the most common being AES and Blowfish. OpenVPN allows users to protect their data using essentially unbreakable AES-256-bit key encryption (amongst others), with 2048-bit RSA authentication, and a 160-bit SHA1 hash algorithm. OpenVPN is also available to almost every platform: Windows, macOS, Linux, Android, iOS, routers, and more. Even Windows Phone and Blackberry can use it! OpenVPN over UDP is often faster than TCP due to having no error correction. While lost packets are inevitable using UDP, certain web technologies are better experienced this way, particularly VoIP and online gaming, where real-time interaction would be interrupted by old, retransmitted data. OpenVPN over TCP is the most popular and reliable VPN connection type. It uses error correction to prevent the loss of information packets during data transfer. These lost packets would ultimately lead to failed websites and incomplete downloads if not for TCP’s automatic retransmitting of them. IKEv2 is a protocol made available exclusively through IPSec, is used to configure the security association, or the specific approach to how the IP packets are encrypted over IPSec. While IKEv2 is only available in newer mobile devices, it is considered a more secure extension of the IPSec protocol because devices can switch between a Wi-Fi and cellular network without disrupting the VPN connection. What Makes VPNArea Special and Strong? VPNArea is reliable VPN service trusted by millions of users worldwide. VPNArea provides different features and highlights to make it powerful and strong. That’s why so many people choose to use VPNArea. VPNArea protects and encrypt all your internet data all the time with different technologies and features like Internet kill switch and AES-256 encryption. You can unblock any contents and live streaming sites with VPNArea as it is powered by Stunnel or Stealth VPN. Kill Switch feature, double VPN, Stealth VPN or Stunnel and other features make VPNArea special and strong. A VPN encrypts and hides your network traffic from third parties. However, even the best VPN connections can fail, leaving your internet traffic exposed. So here comes the Kill Switch technology to solve this problem. Kill Switch is an advanced VPN feature that prevents you from accessing an unprotected Internet connection when your online traffic is not forwarded through VPN. The primary purpose of it is to protect your online activity and IP address from being suddenly exposed in case of a dropped connection from a VPN server. A VPN kill switch solves this problem by automatically stopping all traffic from entering or leaving your device if you are disconnected from a VPN server location. This prevents your network traffic from being routed back through your internet service provider and exposed to prying eyes. VPNArea’s kill switch for Windows, Mac, Linux, and the app for routers. In case the VPN unexpectedly disconnects, VPNArea Kill Switch stops your computer from accessing the internet. Once you are reconnected to the VPN server location, kill switch restores your internet traffic automatically. Kill Switch feature is especially important for BitTorrent users and frequent torrent downloaders, because they probably don’t want their IP address and location exposed to the torrent swarm. Double VPN is a technology allowing to hide online activity behind several servers inter connected via VPN-tunnel. A client is connected to one server which in turn redirects traffic to the second server, with that the traffic is subjected to several encoding steps. Double VPN will make your VPN more secure. Double VPN allows hiding your online activity behind several servers via a VPN tunnel. As a matter of fact, the working principle is rather simple: you connect to the first VPN server, which in turn redirects all the traffic to another server, from which the online traffic reaches the final destination. This way, the connection goes through two separate servers in different locations: the external IP address is changed and the traffic is encrypted once, and then it gets re-encrypted in the second server in another location. Double VPN can help achieve high level of online security and privacy, which is especially required by people like journalists, political activists and bloggers working and living in countries with authoritarian governments along with a high level of Internet censorship and surveillance. If you’re in or traveling to internet-censored countries like China, Iran, Syria, UAE, Ethiopia, Cuba, Russia, India, Eritrea and more, VPNArea with Stealth VPN / Stunnel Technology is your best fit. A ‘Stealth VPN’ is simply a VPN server or protocol that is able to disguise VPN traffic as regular web traffic, even when subjected to deep packet inspection by your network administrator or firewall. Stealth VPN can either be implemented on a server or protocol. When you use a Stealth VPN protocol or server, your VPN usage cannot be detected by firewalls or applications that want to block VPN traffic. Stealth VPN protocols and servers use SSL/TLS encryption that wraps the OpenVPN payload in a second layer of encryption through port #443 (this is the port that normal HTTPs traffic uses), which looks like a normal HTTPS traffic. ‘Stealth’ VPN technology scrambles or disguises your VPN traffic, making it unidentifiable as VPN traffic, or disguising it as regular TLS encrypted web traffic. Using a VPN service with obfuscation or ‘stealth’ technology allows your VPN connection to rewrite or obscure the packet headers, so it’s unrecognizable. Ad blocking feature can effectively block ads and stop your ISP and third party from seeing what addresses and websites you’re visiting with VPNArea’s DNS servers.ad blocking feature can scan the websites addresses you visit and prevent blocklists and users from getting involved in phishing scams and other cyber threats. If you’re visiting a website that may hide hosting malware, trackers, spyware or other malicious software, Ad blocking will immediately activate and stop your visit. VPNArea’s Ad blocking feature also can help skip annoying ads by hiding unwanted popups, autoplay video ads and other advertising material once you open a website. Basically, ad blocking of VPNArea can make users enjoy their favorite contents without ads disturbing and also improves the load speed of the website and saves you some precious mobile data. Enjoy ad-free on the internet and complete security, VPNArea with ad blocking is the best choice. VPNArea is a trusted Bulgaria-based VPN service provider. VPNArea can make you benefit a lot from the service. you can get complete privacy, anonymity and security with cheaper prices. VPNArea protect you from being hacked by ISP, government, hackers and snoopers. Even though you are shopping on line or bill transfer under connecting with the public free Wifi network in café, airport, library etc, you are still protected by VPNArea and all data is encrypted by AES-256 encryption. VPNArea offers the fast speed to let you stream favorite contents from BBC iPlayer, Netflix, Hulu etc in HD without delay or buffering. You can use VPNAre to torrent P2P files. VPNArea has Double VPN feature and Kill switch to offer all-round protection against any prying eyes. Wherever you are using the internet to do whatever you like, you will not be hacked by anyone as long as you run VPNArea on your device. VPNArea works on different major operating systems including Windows, Mac, Android, iOS, Linux and Routers. Up to 6 simultaneous connections allows you to connect different devices with one VPNArea accounts. You even will not be interrupted by malicious ads, popup ads and phishing alert and so on as VPNArea has a strong Ad blocking feature. It is worth having VPNArea and running it on your device anytime. Get Privacy & Break Barriers With VPNArea Now!